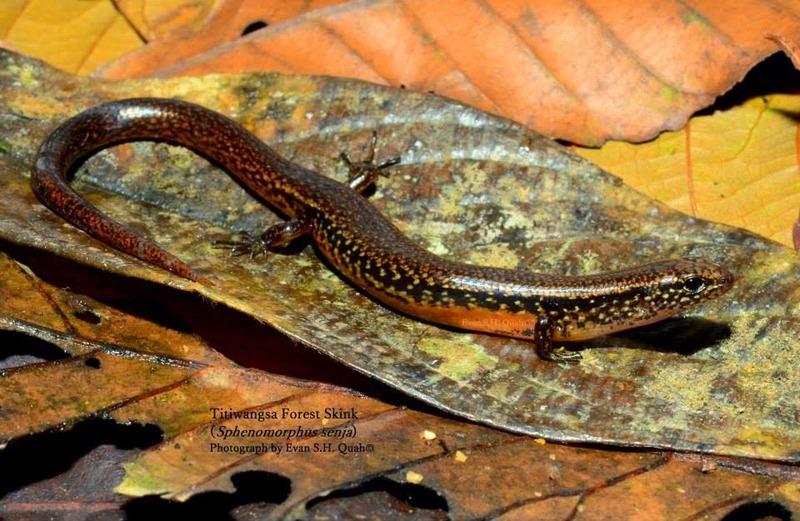 Species New to Science: [Herpetology • 2015] Sphenomorphus senja • The Rediscovery of Sphenomorphus malayanus Doria, 1888 (Squamata: Scincidae) from the Titiwangsa Mountain Range of Peninsular Malaysia and its Re-description as S. senja sp. nov.
[Herpetology • 2015] Sphenomorphus senja • The Rediscovery of Sphenomorphus malayanus Doria, 1888 (Squamata: Scincidae) from the Titiwangsa Mountain Range of Peninsular Malaysia and its Re-description as S. senja sp. nov. The discovery of an additional specimen of Sphenomorphus malayanus Doria, 1888 from Gunung Brinchang, Cameron Highlands, Pahang in Peninsular Malaysia reveals that it is not conspecific with the type specimen from Gunung Singgalan, West Sumatra, 600 km to the south. The new specimen and an additional specimen previously collected from Gunung Gerah, Perak, Peninsular Malaysia, 56 km to the north, are described here as the new species S. senja sp. nov. and differ from S. malayanus by having a larger SVL (60.0–65 mm versus 53 mm); a deeply recessed as opposed to a shallow tympanum; 72 or 73 versus 76 paravertebral scales; eight or nine superciliary scales as opposed to 10; and the posteriormost superciliary scale being large as opposed to small. Cameron Highlands is unique among other upland areas in Peninsular Malaysia in that it harbors an unprecedented number of closely related ecological equivalents living in close sympatry or syntopy. Grismer, L. L. & Evan S. H. Quah. 2015. 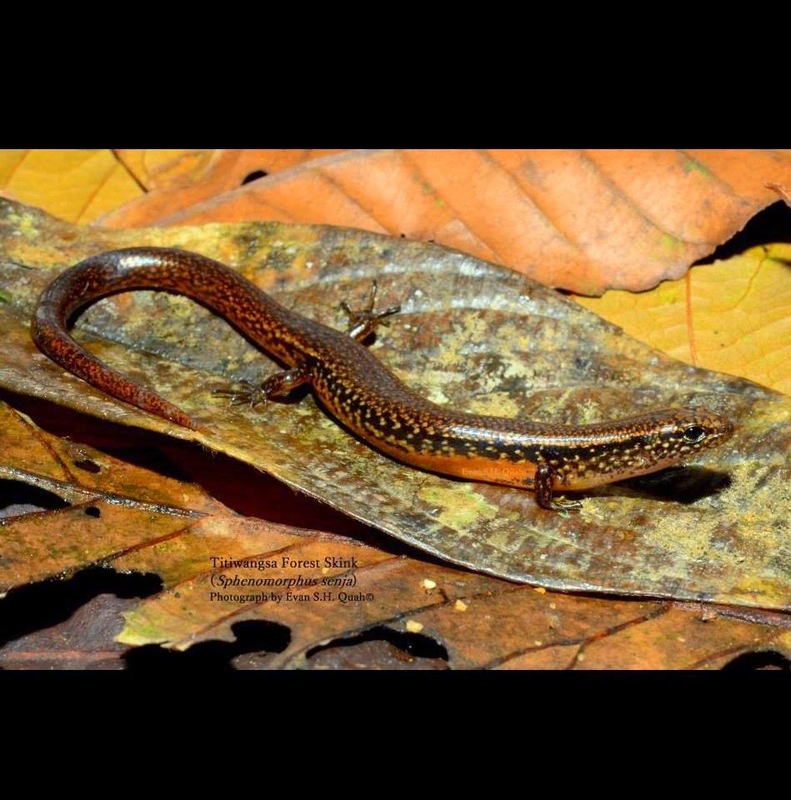 The Rediscovery of Sphenomorphus malayanus Doria, 1888 (Squamata: Scincidae) from the Titiwangsa Mountain Range of Peninsular Malaysia and its Re-description as S. senja sp. nov.